Knowing how to use a brush properly is essential for effective oil painting. 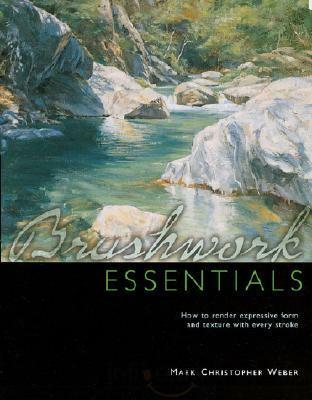 Srushwork Essentials shows artists everything they need to know to render a variety of elegant strokes, along with other exciting techniques like paint mixing and brush shaping. Weber makes mastering each technique easy. He provides detailed, easy-to-follow instructions, step-by-step demonstrations and complementary artwork that highlights each brushstroke as it appears on the canvas. Readers will also learn how to use different strokes to achieve specific effects, such as lighting, shadowing and more. Mark Christopher Weber is an award-winning artist whose work appears in many corporate collections including Shell Oil, Marathon Oil, Grand Canyon Association and the Federal Reserve Building. He is also represented in galleries in California, Arizona, Montana, New Mexico, Utah and japan. Mark lives in Kansas City, Missouri. 8 1/2"x11", 44 p, hc, 200 color illus., May 2002.